The vibrant excitement created by a refined stage drama cannot be replaced by any modern form of art. That is why stage drama stays in the forefront for years. National Drama Festival 2011 is a prominent event in country’s stage drama calendar, through which a lot of young dramatists emerged their artistic potentials. After competing with a number of first-class dramas, Janelen Paninnada became the best among them, winning six prominent awards. The drama was directed by a young lady who is enthusiastic and academically qualified, Dhanushika Nayanakumari. 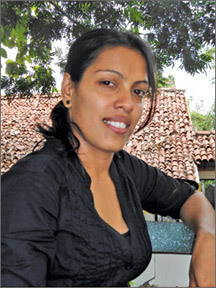 She is a graduate of Kelaniya University who has obtained a special Degree in Drama and Theatre. She is a student of Wikramashila National School, Giriulla. She has instinctive desire to involve in the field and currently teaches Drama and Theatre at St. Paul’s Girls School. Her ultimate objective is to engage in the drama industry as a director and a producer while providing her knowledge to the upcoming generation being a teacher in profession. Janelen Paninnada was presented by Academic Players of Kelaniya University. The winning drama team is a gang of university students who are following the same degree. They are very enthusiastic and are very talented dramatists who lead their drama to be the best among others. First they did the drama as a practical assignment when she was in the third year. And gradually they developed its features and formed it to a very good drama. Dhanushika always wanted to use her academic knowledge practically and she was the one who led the team to make the drama a success. “I think the secret of our success is our unity, team work and hard work. I got an immense support from each and every member of the drama team. From the beginning we knew that we have the ability to do something remarkable. So we always worked as a team to achieve that. This is our first long drama which is staged,” she said. “The drama is basically about the life of university students. The drama forms around one major character, a university girl who faces a lot of ups and downs in the university time. Her character illustrates the university life in different aspects. The drama points up how love, affection, politics, social issues affect on an undergraduate’s life. But this is not framed to the university life but has a broad social approach. We have created very complex characters that perform in a very simple manner,” stressed Dhanushika. The major character or the main actress of Janelayen Paninnada, Prasadini Athapattu expressed her pouring happiness of becoming the best actress. She is a student of University of Kelaniya who follows Drama and Theatre Degree. “I really like the character, Waruni who is a real portrait of an undergraduate girl who is unknowingly caught by the external forces and faces a lot of challenges throughout the university life. I think I formed my character in a perfect way that the expected message is well conveyed to the audience,” Prasadini said. She is enthusiastic to continue her drama career as an actress who is currently a Drama and Theatre teacher of Visaka Vidyalaya, Colombo. Dhanushika gives her special thanks to Priyankara Rathnayake, Thumindu Dodanthenna and Academic Players drama society, Drama and Theatre and Image Art Department of Kelaniya University.